Rocket Roy ($1.99) by Thijs van den Berg is an adventure game that also combines physics-based elements with some puzzles to make a unique title. 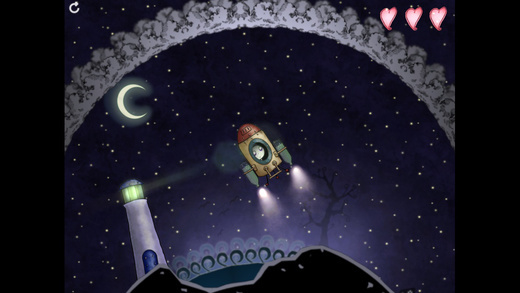 Think of it as a children’s book meets music box meets video game, and you will end up with something like Rocket Roy. While I love a challenging and fast-paced game, like Incandescence, to test out my skills, sometimes I just need a game that I can just unwind with after a long day. That’s where Rocket Roy comes in. 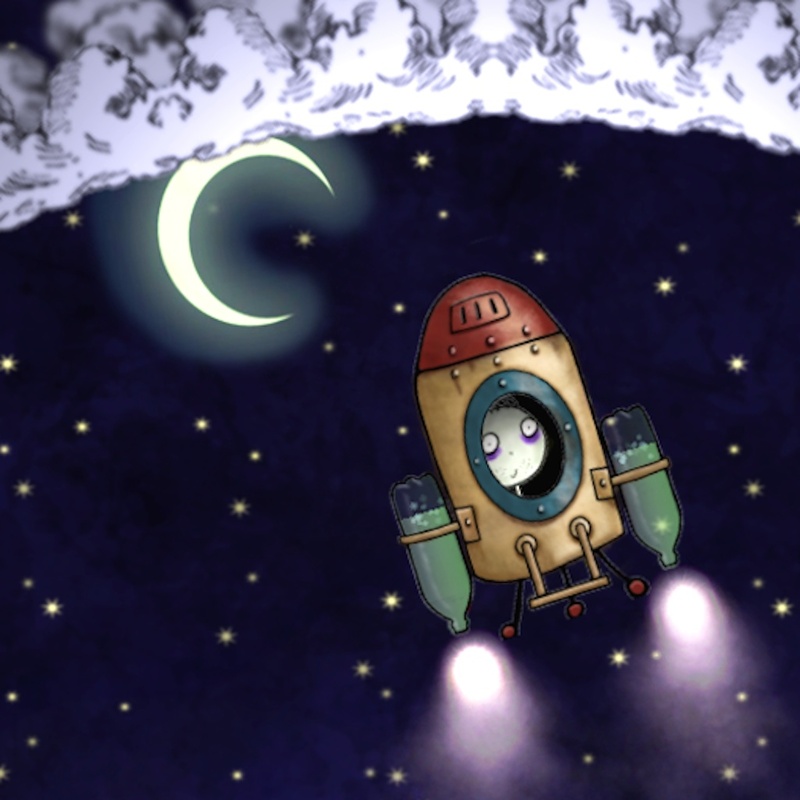 Rocket Roy features a distinctive visual style that reminds me of Tim Burton movies. In fact, if I didn’t know anything about this game and saw it in the App Store, I’d probably wonder if Burton himself made it. The graphics are dark, moody, and a tad creepy looking, but in a good way. 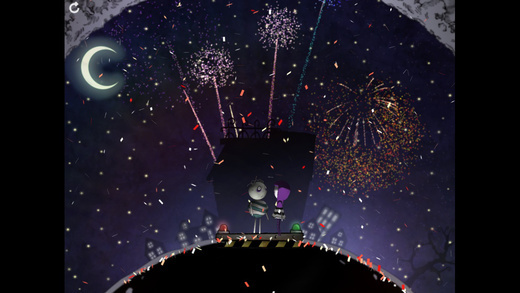 The two characters, Roy and Jezebel, appear as if they were pulled out of one of Burton’s movies, which is sure to appeal to fans. Everything is detailed, though I did notice that some components, such as text, seemed a bit fuzzy on my iPhone 6 Retina HD display. The animations are smooth, though a bit slower than I’d like. 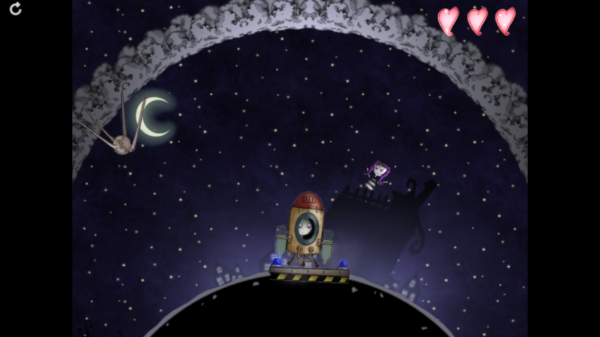 The soundtrack is soothing — like a whimsical music box, and fits in well with the overall theme of the game. The story of Rocket Roy is simple and cute. Roy loves Jezebel a lot, but there is one problem: she lives on the other side of the world. 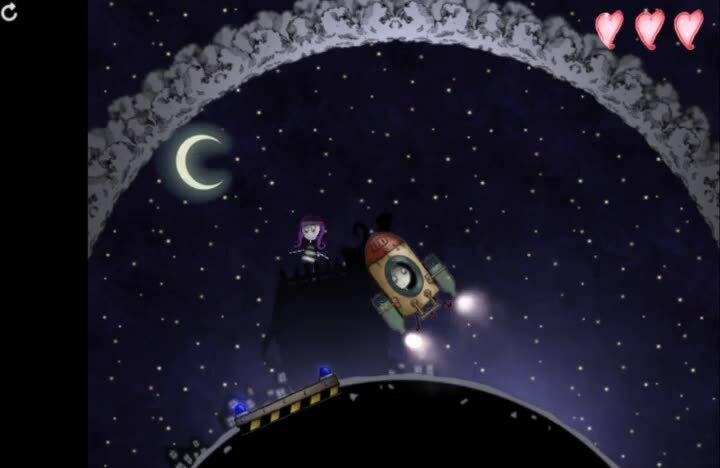 Since Roy needs to be with Jezebel, he builds his own rocket contraption to fly to her house, pick her up, and take her back to his house so they can spend quality time together. 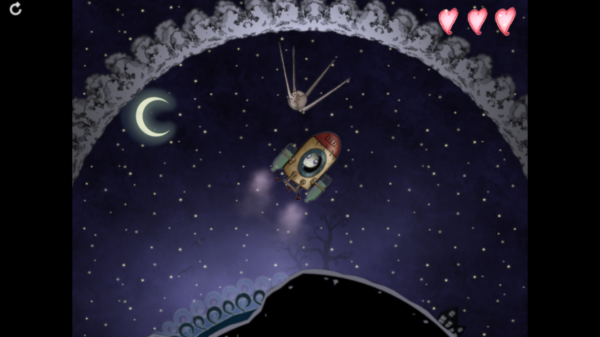 There are 26 levels in Rocket Roy, which may not seem like too many, but I can guarantee that it will take a bit of time to get through them all. You have to go through them in order, to an extent. 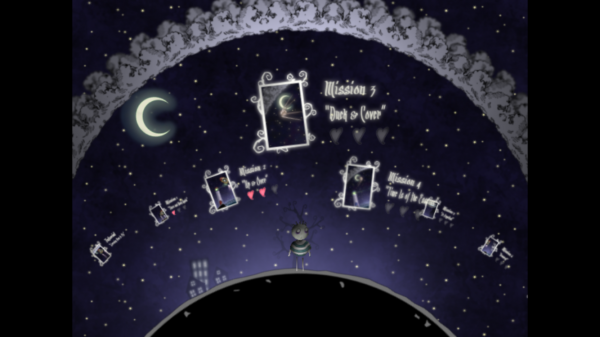 As you complete a few stages, a several more will be unlocked at once, so you can play through those in your own arrangement. 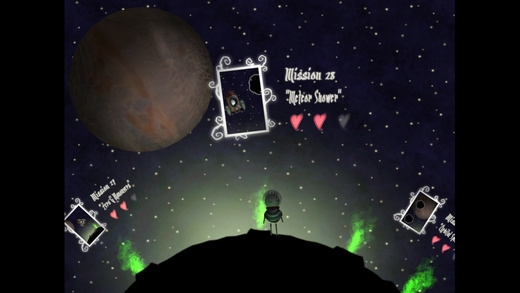 The goal in each level is the same: help Roy pick up Jezebel and return back home together. 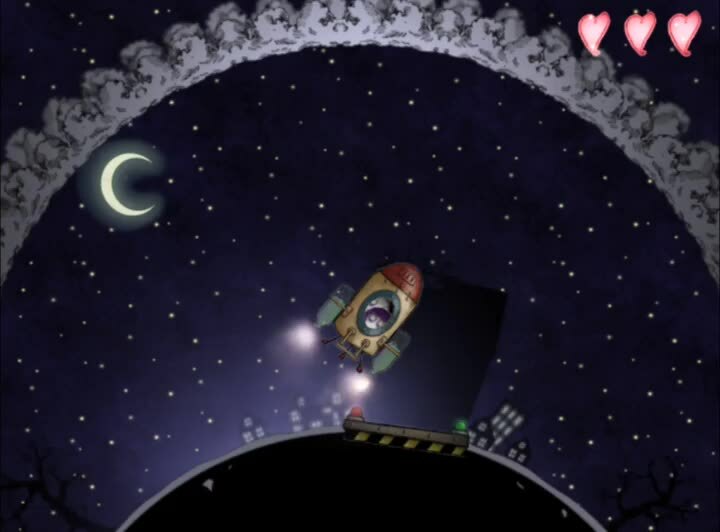 The game starts out easy at first, but then you’ll encounter towering lighthouses, fast-moving satellites in orbit, mountains, Space Invaders, and much more. Considering all of that, Rocket Roy is much more challenging than it first appears to be. To top it off, there are three hearts in the corner. The hearts represent the amount of fuel left in your ship. The faster you can get Jezebel and return home, the better, as you earn more points for having hearts left over. The amount of time it takes you to finish also factors in to your final score, so time is of the essence in Rocket Roy. Oddly enough, though, there is no Game Center support in the game for leaderboards, so I’d like to see this in the future. The controls in the game are simple, though I think they can be improved, as I’m not a big fan of how they are now. 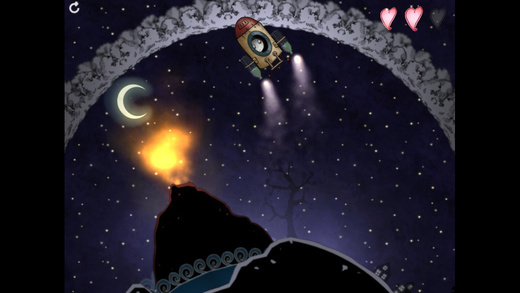 To launch and propel the rocket through the air, just tap on the screen. In order to steer your ship, though, you will need to tilt your device left or right to go in that direction. I found the tilting to be a bit cumbersome and weird, since the sensitivity wasn’t that great with my iPhone 6. There is no game options menu, so you can’t adjust the sensitivity of the tilting or use an alternative control scheme — I think having directional buttons in the bottom left, and boosting in the bottom right, would have worked better. Hopefully the developer can consider more control options in a later update. Despite the controls, I find Rocket Roy to be an enjoyable title. 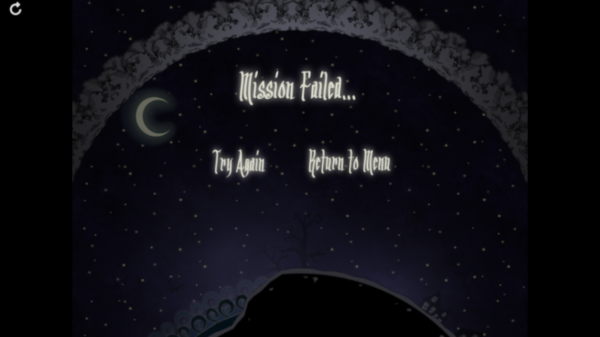 The visuals are cute, music is calming, and the game has a simple concept but ends up to be pretty challenging. I just want better controls, Game Center integration, and slight changes to some graphic aspects to make them appear less fuzzy on Retina HD screens. 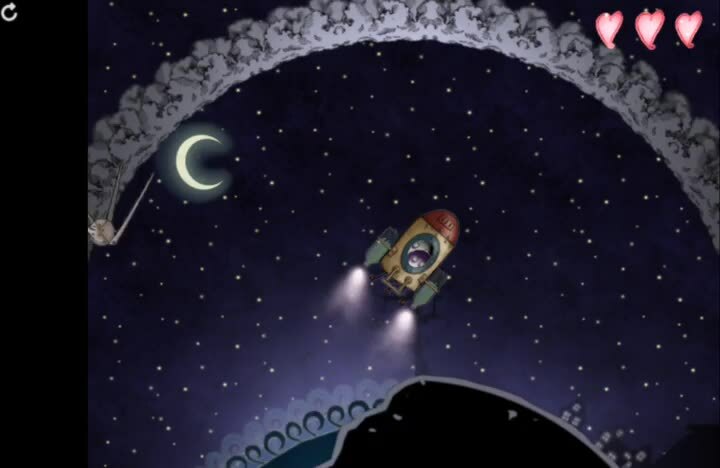 But if you are looking for an adventure game that distinguishes itself from the rest, then Rocket Roy is worth a look. 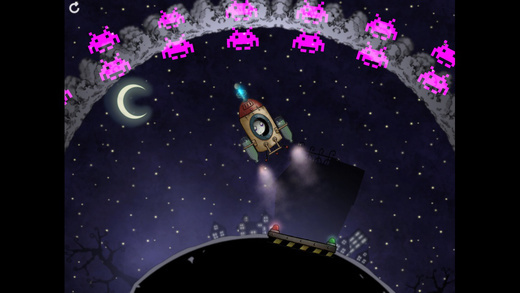 You can get Rocket Roy on the App Store as a universal download for $1.99. There is also a free version available, which includes the entire game but is supported by ads.